"My primary career goal is to develop an independent health services research program that will inform evidence-based approaches to improve kidney transplant access and clinical outcomes for patients with kidney disease. My research project for the KL2 program involved developing predictive models to assist end stage renal disease patients and care providers in making treatment decisions, and translating this information into a decision support tool for use in a dialysis clinic," said Rachel Patzer, PhD, MPH, assistant professor, Emory University School of Medicine, Emory Transplant Center. Creation of this tool was also supported by the ACTSI's biostatistics, biomedical informatics, and Clinical Research Network programs via a Studio Consultation. 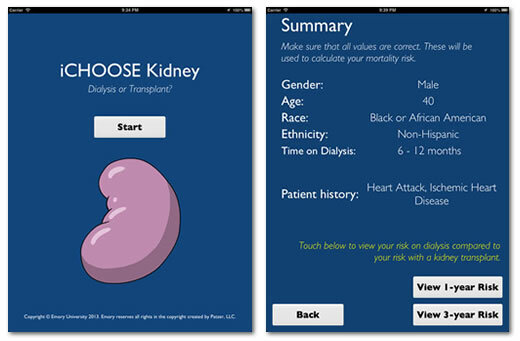 Patzer also received a $1 million R24 grant from the National Institute on Minority Health and Health Disparities that involves the iCHOOSE tool as one component of an intervention to improve access to kidney transplantation among 134 dialysis facilities in the state of Georgia. In a recent article in Science Daily, the fact that the Southeast (and Georgia in particular) has the lowest kidney transplant rate in the nation was discussed and Patzer and her work was featured. The goal of the ACTSI KL2-Mentored Clinical and Translational Research Scholars (MCTRS) program is to support career development for junior faculty (MD, PhD, or MD/PhD) from a wide variety of disciplines at Emory University, Morehouse School of Medicine, and Georgia Institute of Technology to become independent, established, and ethical clinical and/or translational research investigators. KL2 scholars receive salary support, a budget for their research, and tuition for the Master of Science in Clinical Research (MSCR) degree. Patzer was also a short-term TL1-Medical Scientist Trainee when she was a PhD student at Emory.